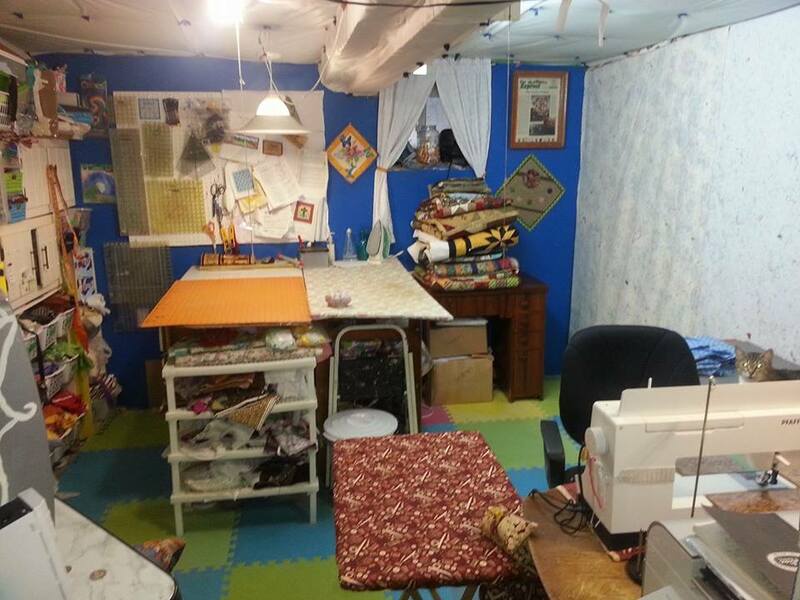 I thought I’d give you a tour of my sewing room before I do I want to let you all know that it is not fancy and just about everything in it has been recycled or reused for different purpose. Sewing Space I sew on the 1st table I had when I moved out. Next to it is an old computer desk that makes an L shaped work space. I made an extension table with the sink hole from the counter top when we redid the kitchen. On the right of my work space is a Coffee/Card Table with a piece of plywood covered with batting and cotton placed on top. This makes a travel sized ironing board. CD shelves hold fat quarters. Cutting and Ironing space My main Iron board is made from the change table came with the boys crib set I just place a 2 x 4 piece of plywood covered with batting then cotton. I set the old tv on top of the stacked end tables from my mom. The cutting area is made from the peninsula cupboard from the kitchen before it was renovated. As well as all the other cupboard that store fabrics. The floor is made with those rubber puzzle mats since I’m in the basement and the floor is not finished. The mats absorb the cold well and is way less tiring when standing for long hours. Also if the basement floods wish it does on wet springs since we live in a river valley its easy to take out and spay clean. The lighting is made from focus lights that I placed over the work space and the one pointing to the design wall (Made from plastic felt backed picnic tablecloth stapled to the wall) is old ballast fluorescent lights for the porch when I changed out the lighting. I put up a tack board and a peg board to hold up all my rullers and tools. The room is only about 13 x 13 feet and almost every inch is utilized. Here is the YouTube link to me room….My Sewing Dungeon Just click on and it will take you there.